One of the most exciting weekends of the year is among us in Arlington, it&apos;s dirt season at AT&T Stadium! *This just in, they added a $25,000 bonus bull to the event, which will be chosen during the competition. Whoever gets the Bad Boy Mowers Bounty Bull and rides a qualifying 8-seconds or more, wins $25,000 as a bonus. If he doesn’t win, the bounty will transfer to the next PBR Major in Vegas. Meaning, the bounty will be $50,000. Nice perk, right? Tickets are going fast and start at $20. One day after PBR, the richest one-day rodeo in history gets its boots dirty at AT&T Stadium. Featuring some of the competitors from PBR (who only get a night’s rest in between events), the American invited the top 10 athletes in seven events in the professional world rodeo standings to compete for $1 million. This year, there will be 61 world champions collectively. The cool thing about this event is the prelims that take place in Fort Worth pit the professionals against talented amateurs for their shot at the pot. This year, RFD-TV has created The Triple Crown on Feb. 28, whereby if one of the three athletes who has won their event for two years straight should win a third time in 2016, they can win all or a portion of the million-dollar bonus. Those athletes are saddle bronc rider Wade Sundell, barrel racer Lisa Lockhart, and team roper Kaleb Driggers. Tickets are available and they start at $20. Honorable Mention: AMA Supercross – THIS WEEKEND! Monster Energy Supercross Round 7 is back at AT&T Stadium. Qualifying starts at noon and the main event at 6:30 pm. Watch some the world’s biggest daredevils maneuver their way around the dirt track. Tickets start at $20 not including taxes and fees. 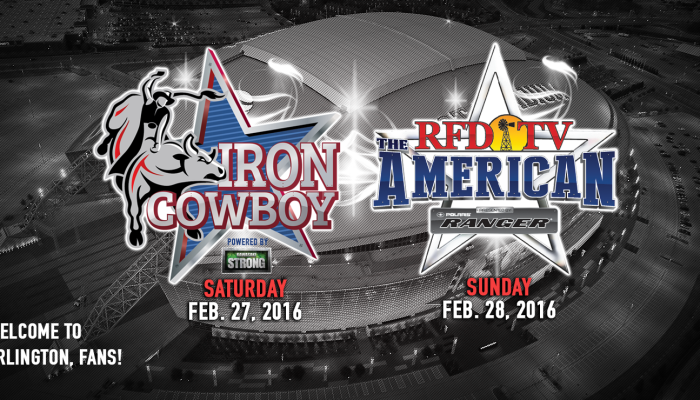 Want to win a family four pack of ticket to PBR’s Iron Cowboy & RFD-TV’s The American Rodeo? We’re giving away tickets to both events on our Facebook page this week. Keep an eye out this week and next for your chance to bring your family to not just one but two incredible events on dirt!